Army Ranger Sgt. 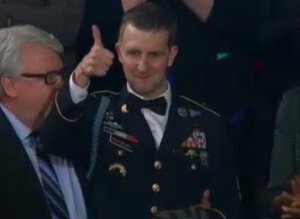 1st Class Cory Remsburg received a standing ovation after President Barack Obama told his story during his State of the Union address on Tuesday. “Cory is here tonight. And like the Army he loves, like the America he serves, Sergeant First Class Cory Remsburg never gives up, and he does not quit,” Obama continued. President Barack Obama gave his 2014 State of the Union address on Tuesday. Obama delivered the speech in front of a joint session of Congress. Today in America, a teacher spent extra time with a student who needed it, and did her part to lift America’s graduation rate to its highest level in more than three decades. An entrepreneur flipped on the lights in her tech startup, and did her part to add to the more than eight million new jobs our businesses have created over the past four years. An autoworker fine-tuned some of the best, most fuel-efficient cars in the world, and did his part to help America wean itself off foreign oil. A farmer prepared for the spring after the strongest five-year stretch of farm exports in our history. A rural doctor gave a young child the first prescription to treat asthma that his mother could afford. A man took the bus home from the graveyard shift, bone-tired but dreaming big dreams for his son. And in tight-knit communities across America, fathers and mothers will tuck in their kids, put an arm around their spouse, remember fallen comrades, and give thanks for being home from a war that, after twelve long years, is finally coming to an end. Tonight, this chamber speaks with one voice to the people we represent: it is you, our citizens, who make the state of our union strong. Here are the results of your efforts: The lowest unemployment rate in over five years. A rebounding housing market. A manufacturing sector that’s adding jobs for the first time since the 1990s. More oil produced at home than we buy from the rest of the world – the first time that’s happened in nearly twenty years. Our deficits – cut by more than half. And for the first time in over a decade, business leaders around the world have declared that China is no longer the world’s number one place to invest; America is. That’s why I believe this can be a breakthrough year for America. After five years of grit and determined effort, the United States is better-positioned for the 21st century than any other nation on Earth. The question for everyone in this chamber, running through every decision we make this year, is whether we are going to help or hinder this progress. For several years now, this town has been consumed by a rancorous argument over the proper size of the federal government. It’s an important debate – one that dates back to our very founding. But when that debate prevents us from carrying out even the most basic functions of our democracy – when our differences shut down government or threaten the full faith and credit of the United States – then we are not doing right by the American people. As President, I’m committed to making Washington work better, and rebuilding the trust of the people who sent us here. I believe most of you are, too. Last month, thanks to the work of Democrats and Republicans, this Congress finally produced a budget that undoes some of last year’s severe cuts to priorities like education. Nobody got everything they wanted, and we can still do more to invest in this country’s future while bringing down our deficit in a balanced way. But the budget compromise should leave us freer to focus on creating new jobs, not creating new crises.